Good Morning Everyone! I have so many exciting things to share with you today! We've been very busy at Creekside Quilting the past week and I just want to thank each of you who have journeyed to stop in and see us! This week's newsletter is filled with surprises, so brace yourself! 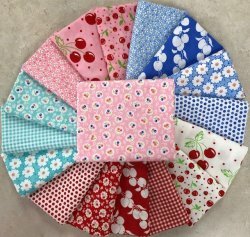 We received in a shipment of the Stephanie Brandenburg In and Out Pattern and Fat Quarter bundle! This has been long awaited for and I am so happy they are back in the store! This cute table runner, is a Patrick Lose Panel. I needed to fold up the panel to take the picture, but the middle has green and red stripes. 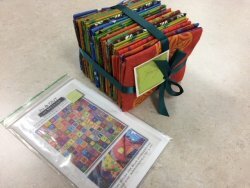 It's easy to put together, yet a great way to practice your free motion quilting! Patrick Lose always suggests using two sided fusible batting on smaller projects like this, and we do happen to carry The Warm Company's two sided batting in the store. 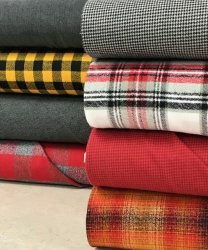 Look at these gorgeous Mammoth and Shetland flannels! Just in time for football season! I can see a nice warm quilt, to keep the bum warm, on football Saturday's this fall! Yesterday, we received the Badda Bing, My Sister and Me Designs by Moda! We all agreed this line would look great in a Farm Girl Vintage quilt...or any quilt needing the farm or vintage look. Barb, Fran, and I all fell in love with it right away! 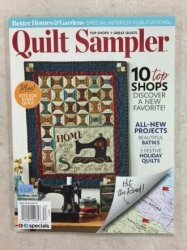 The latest issue of the Quilt Sampler arrived last Friday! As always, it doesn't disappoint! 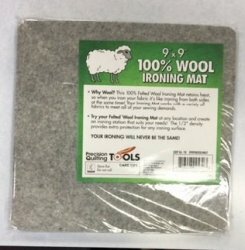 Some of you have been asking about the 100% Wool Ironing Mat. After it being on back order since June, we were surprised last week when we received a shipment! Although I have never tried this wool mat, I have heard your raving reviews! 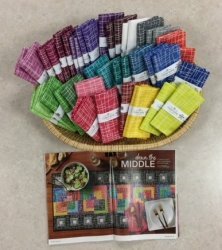 Lastly, on Friday, Rhonda found this article in one of our magazines using our Pick-up Sticks fabrics as a table runner. The table runner is bright and contemporary, and looks pretty easy to make with simple blocks. Another surprise we were not expecting! Another surprise we were not expecting, is due to circumstances way beyond our control, we are going to have to suspend all Pfaff sewing machine repairs and sewing machine cleanings for awhile. As of now, this is a suspension, and we hope to continue this service again in the near future. If you have a machine waiting repair, already in the store, our technician will be calling you when they are finished and ready for pick-up. We just will not be receiving any new orders at this time. Thursday, August 28th in the afternoon and the evening. We still have plenty of room for people to join us in the UFO Friday Afternoon Club that meets August 31st from 1-4 pm. If you have any UFO's, this club is for you! $10 for the whole year, wine and cheese every month, and prizes at the end of the year! Great motivational way to get the UFO's that are sitting on your sewing table, completed! Have an idea for a class or technique you would like to teach? Let me know! I'd be interested in hearing your ideas! This week's coupon is 15% off all needles. Limit is 3 packages of any combination. Please mention at time of checkout, you saw this coupon in the newsletter to receive the discount. Hope everyone has a great week! Next week is the August full moon. One can only wonder what surprises await us!